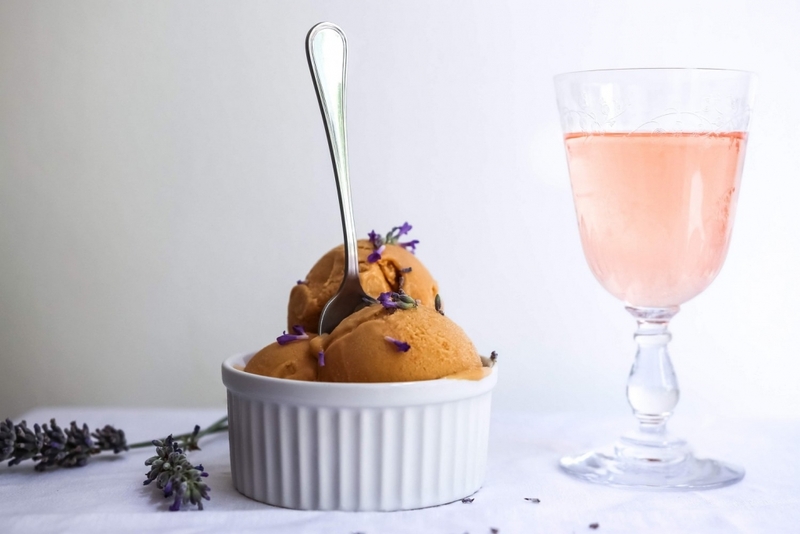 Here is an original and summery ice cream recipe that tastes just like Provence! Lavender pairs extremely well with stone fruits such as apricot, peach, or plum and brings a subtle and fragrant taste. 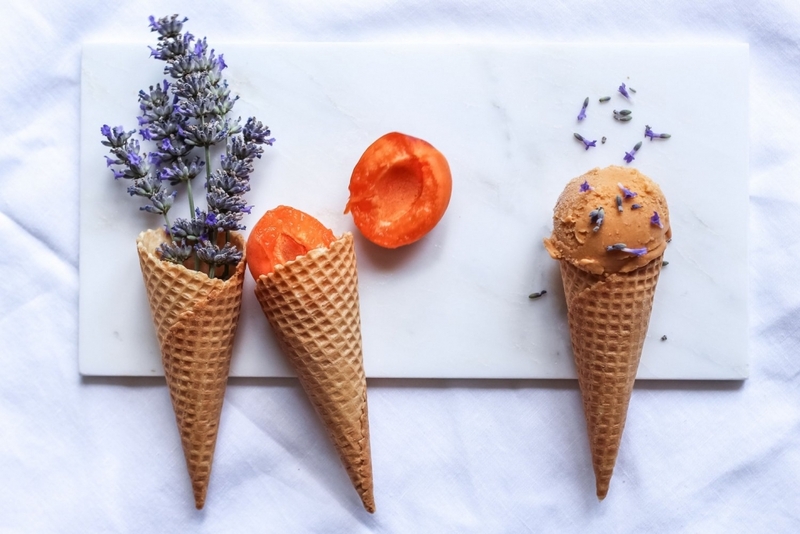 In ice creams and sorbets, apricots bring a velvety and meaty texture. No eggs needed for this recipe, just delicious ripe fruits, sugar, cream and lavender. If the fruits you are using are especially sweet, you can even lower the amount of sugar to 70-80g. 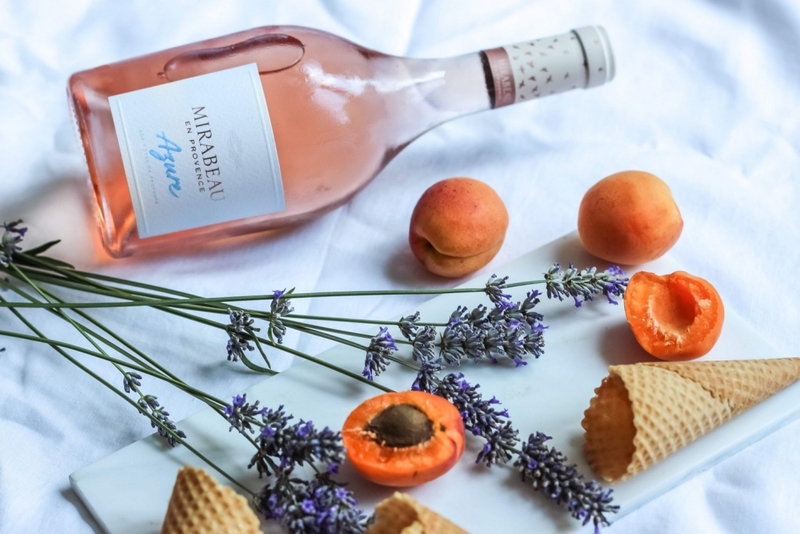 Please note: Mirabeau Azure provence rosé, featured in this post, is available at select restaurants in the UK and USA. In a small saucepan, bring cream and sugar to a boil. Remove from heat, add the whole lavenders and cover. Let the lavender infuse for 10 minutes, then sieve to remove all the flowers. Put the apricots and peach in a blender and mix for about 30 sec to 1 min, until smooth. Press the apricot purée through a sieve into a blender. Add the cream. Mix until homogeneous. Cover and put the mixture in the fridge for at least 2 hours. You can even prepare it the day before and leave it to rest in the fridge overnight. Freeze according to your ice cream maker’s instructions (usually between 20-40 minutes). Transfer into a freezer safe container and freeze for at least 3 hours before serving. Tip: Lavender can be very overpowering, so make sure not to use too much and not to infuse the flowers for more than 10 minutes.